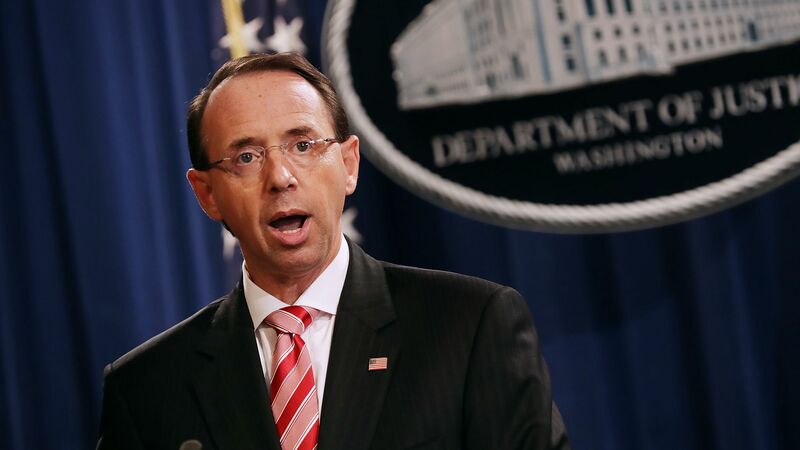 Rosenstein says intelligence, indictments are "based on evidence"
Deputy Attorney General Rod Rosenstein said Thursday that conclusions reached by U.S. intelligence agencies and criminal indictments presented are "based on evidence," adding that they don't "reflect mere guesses." Why it matters: Rosenstein's remarks came after President Trump raised doubts at a press conference with Vladimir Putin about U.S. intelligence agencies' conclusion that Russia had meddled in the 2016 presidential election. "Intelligence assessments include analytical judgments based on classified information that cannot be disclosed because the evidence is from sources — people who will be unable to help in the future if they are identified and might be harmed in retaliation for helping America — and methods — techniques that would be worthless if our adversaries knew how we obtained the evidence. Indictments are based on credible evidence that the government must be prepared to introduce in court if necessary."